Many areas have been covered by a canopy for protection from the sun in the intervening years since opening day. I sure don't envy those people ( in line for the Haunted Mansion ) standing in the Florida sunshine on card 01110216 CRUISING THE RIVERS OF AMERICA. A note of trivia the steamboat featured on this card, The Admiral Joe Fowler has a very similar appearance to the Mark Twain riverboat at Disneyland, the Mark Twain at Disneyland Tokyo, and the Mark Twain at Disneyland Paris. Disneyland Paris also has a second steamboat of a different design the side wheeler Molly Brown on its river. The Admiral Joe Fowler Riverboat served from Oct. 2,1971, one day after park opening, until the Fall of 1980, when it was retired from the waterways. This was an early retirement, it was less than 10 years old at that point. 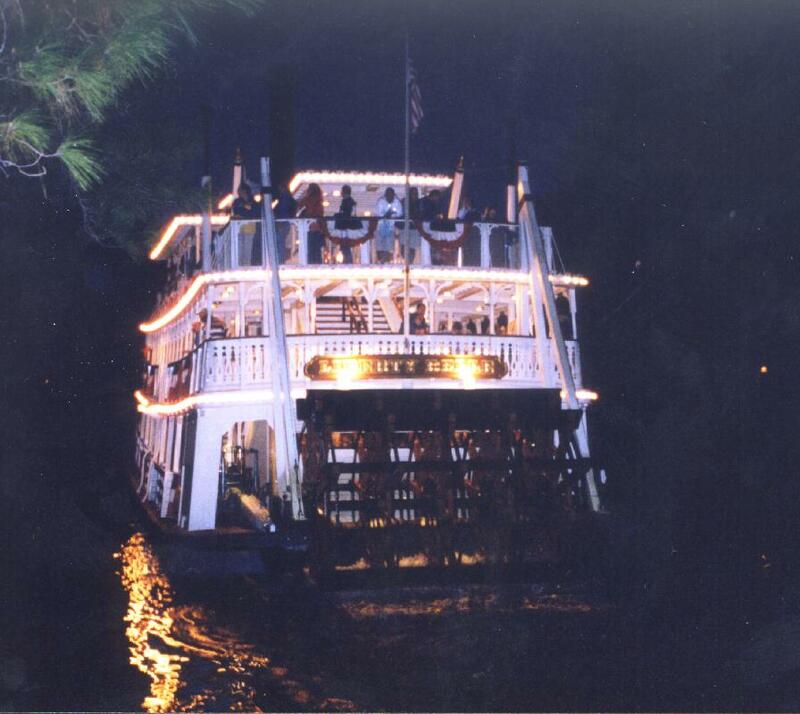 The Mark Twain at Disneyland is closing in on 50 years old,of course, it has had some rather extensive rehabs. I've found a great web page that tells what happened to the Fowler. 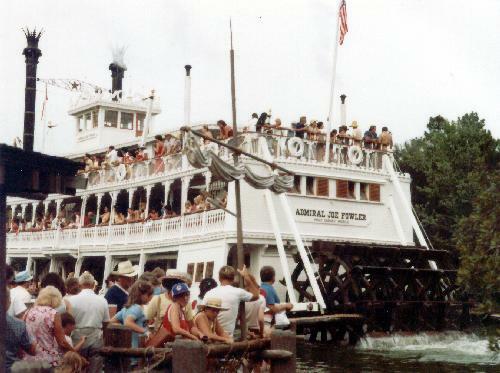 that page is at: http://waltdatedworld.com/id141.htm It is part of the great WDW history web site Walt Dated World which is located at http://waltdatedworld.com It says "In 1980, The Admiral Joe Fowler was taken to dry dock for routine rehab. While the boat was being lifted by crane, it slipped and the hull was completely destroyed. The boat was then retired due to "mechanical problems". The broken boat was taken to the backstage "bone yard" for awhile before being buried somewhere on the property." I have also heard a slightly different version of the story , that it wasn't centered properly over the carriage and slipped when they drained the water. Same results either way. Since they have a Marine railway for moving the ships to the building where the rehabs are done they should not have needed a crane and this might be more likely. I have also found a more detailed accounting (contributed to the parktransit group in yahoo groups by John Gilson) of what happened to the remains of the Fowler. The whistle is on The Walt Disney World Rail Road steam engine #4 the Roy O. Disney . The steam engine parts went to Disneyland Tokyo. and what was left was sunk in Bay Lake and serves as a fish habitat. Bruce Metcalf (Zazu to you RADPers ) who works on the WDWRR confirms the whistle story and adds that it "Gives it a lovely low tone that's quite distinct from the other three engines" and gives us his take on the possibility the steam boats engine parts went to Tokyo . "I've no data on the fate of the steam engine, but a 10-year-old engine from a boat with a broken keel should be in fine shape for reuse on a new boat." I thought that considering the time in which the Fowler had it's demise that it would be neat if something made it into the Tokyo steamer it is nice to hear that it's likely that did happen. I still wonder what happened to the bell though perhaps it is in Tokyo too if so I wonder if there is any inscription on it that would identify it (that would make a nice picture also I think). As for the story on what happened to the remains of the Admiral Joe Fowler stern-wheeler Capatain Jeff (Jeff Pleshek),a Watercraft Host (Seven Seas Lagoon/ Bay Lake) from 5/11/73 until 1/31/2000 , had this view including a more detailed explanation of how the ships are readied for dry dock re-habs: All large vessels that needed rehab were towed to Drydock. There is a SynchraLift that has the marine railway tracks on it. The procedure was to lower the SynchraLift carriage that supports the vessel, tow, pull or drive the vessel over the SynchraLift carriage and then winch it up. After that, one can pull, push the carriage on a set of rails to wherever work needs to be done. There also a Tammi-Lift that is a sling lift to haul the motor launches and motor cruisers out of the water. With that being said, I see no reason for the Admiral Joe Fowler riverboat to be raised by a crane, slipping and damaging the hull. I know that no boats were ever sunk in Bay Lake or the Seven Seas Lagoon for the purpose of fish habitat nor buried on the property. 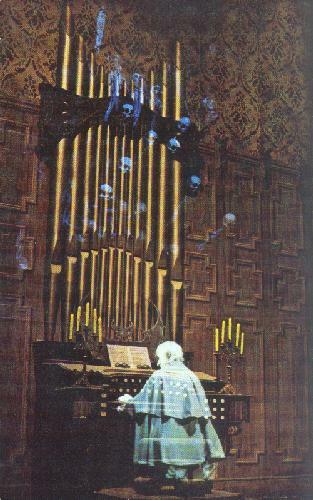 If you think about the loss of a useable asset, even as a decoration or eBay auction material, you would understand that Disney would never do such a foolish thing as bury or sink on purpose. 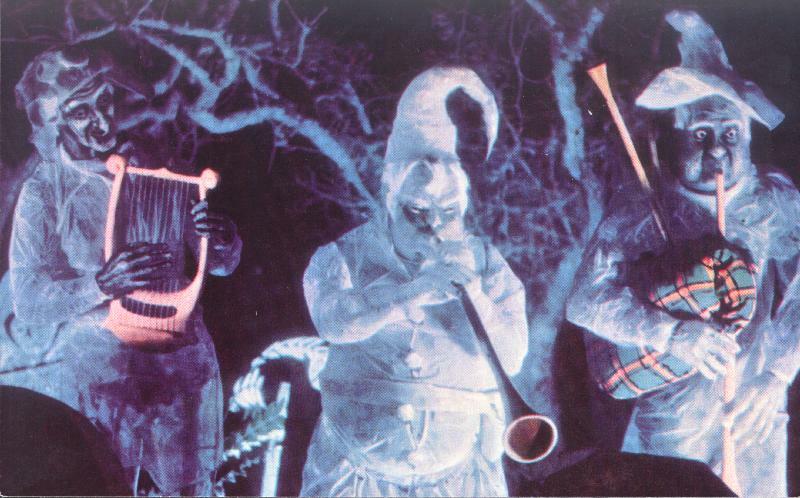 The two photos below are from 1979 and are here courtesy of Martin Smith. It's a nice paring with one shot that looks to me as if it is taken from Tom Sawyer island, and another nice shot including the name plate and the Tom Sawyers island raft in the foreground. The Fowlers sister ship, The Richard F. Irvine didn't go into service until May 20, 1973. Issue 180 of the All Ears newsletter http://allearsnet.com/ published the following quotes from a 1973 issue of the Cast publication Eyes and Ears: "The 42 men in the Metal Shop in the Facilities Division are familiar with three different types of vessels because, since opening, they have become tradesman in the art of building boats." 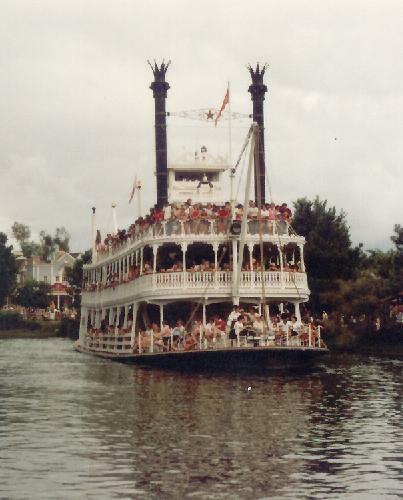 "When the Rivers of America needed another boat, the next question was, 'Who will built it?' After much investigation, pencils, paper, and figuring... everything pointed to the building right here on property. Thus, the Richard Irvine became the first attempt at boat building for the metal shop." "The Irvine is a 400-passenger sternwheel paddle boat which is a replica of those river boats that paddled up and down the Mississippi River in the 1800s. Construction took about six months." "Of course, the Metal Shop can't take all the credit. The Planning Department begins months ahead of time to prepare production schedules and lists of materials. The Mill Shop, Paint Shop, Staff Shop and Electric Shop all contribute their part to the finished product." 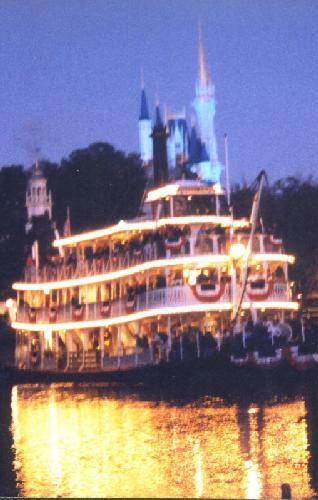 In 1996 the Irvine recieved an extensive rehab and was renamed the Liberty Belle. The Irvine/ Belle has only one smokestack as compared to the Fowlers and (Twains) two. Despite being out of service for so many years The Fowler still pops up from time to time sometime mis-identified as the Irvine. 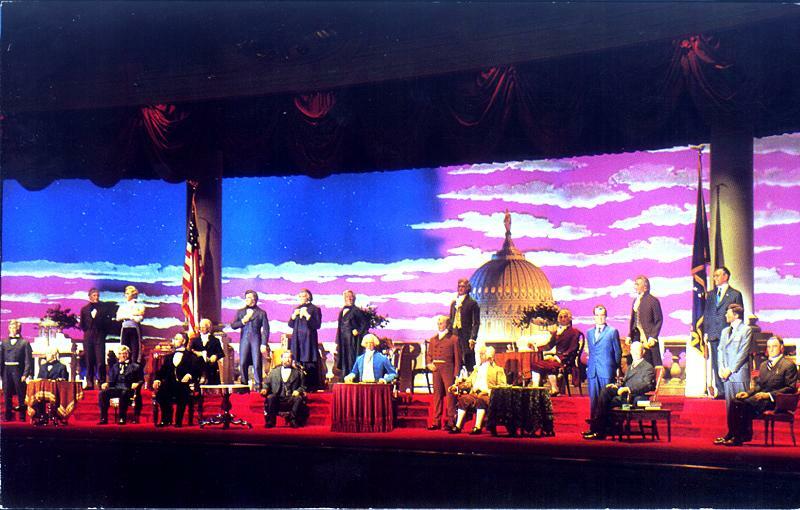 One of the most glaring instances of this, was in the 1998 souvenir hardcover, titled Walt Disney World A Magical Year-By-Year Journey, which had a beautiful full page picture of the Admiral Joe Fowler identified as the Richard F Irvine even though the text on the identifying plaque on the ship is clearly legible in the picture. If you go looking for it in your copy of the book it is near the back in the 1972-1981 section. Ironically the 1972-1981 does nor refer to the Fowlers life span, that edition of the hardcover WDW souvenir book was and organized from future projects and then backward through WDWs history, so 1971-1982 basically refers to the whole section on the pre-Epcot era. 01110227 LIBERTY SQUARE FIFE AND DRUM CORP features these live entertainers that help give that colonial era flavor to Liberty Square. .
Cards 01110224, 01110225, 01110226 are all titled THE HAUNTED MANSION . I wonder how they got the "Ghost " effects to show up in that photo on 0110226 especially as the angle of the shot looks to me as if it was taken from the Ballroom floor rather than the Doom Buggy (Omnimover) track. 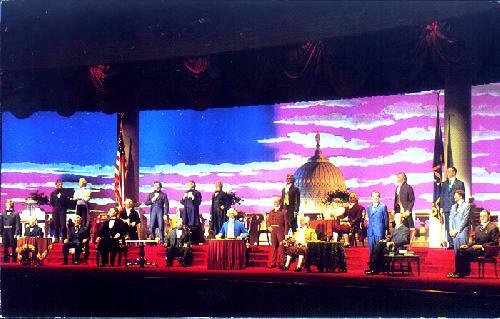 The care pictured above 01110228 THE HALL OF PRESIDENTS is one of the few attractions that was unique to the Magic Kingdom on opening day and continues to be un-duplicated by any other Disney theme park to this day. 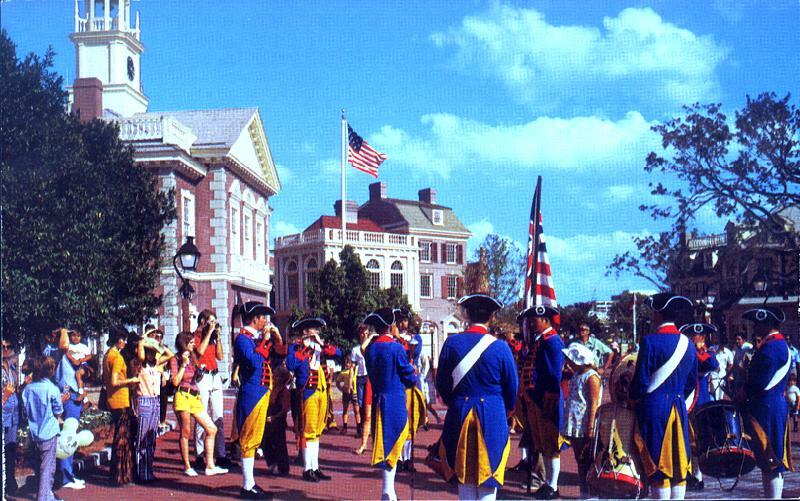 On opening day Liberty Square looked pretty much as it does today, keel boats provided river tours, ghosts haunted, audio-animatronic presidents gave speeches, and saloon girls danced. 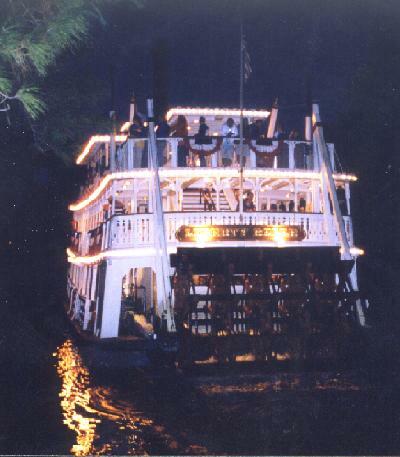 And, starting the next day the Stern-Wheeled river boat "Admiral Joe Fowler" began it's circuts of Tom Sawyers Island. 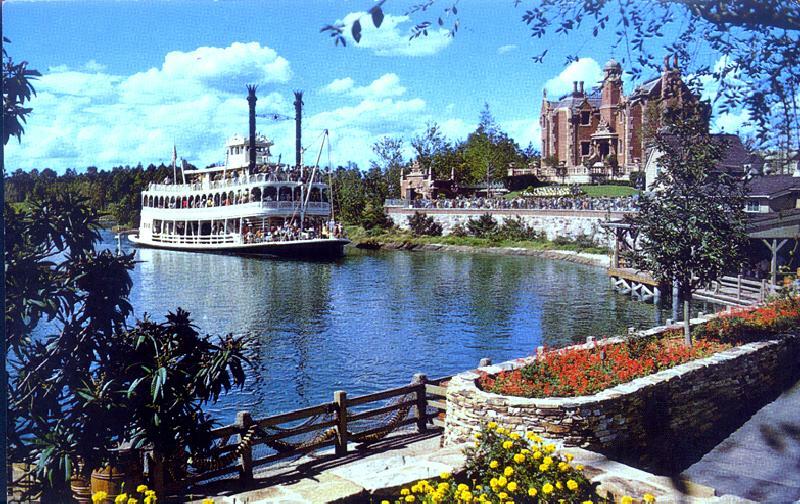 However, there would be no rafts to Tom Sawyers Island for over a year and a half, the Isle had yet to be completed. 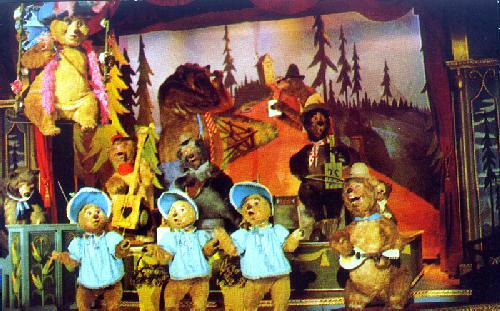 Frontierland had it's similarities to how it looked in later years as well, The Country Bear Jamboree was there, along with the rest of the frontier town street buildings, and the Davy Crockett Explorer Canoes. 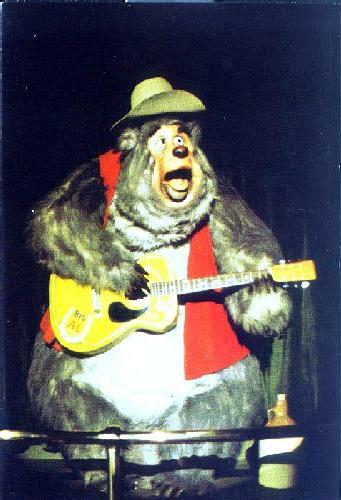 Of course there wasn't much when you got out towards what is today the far end of Frontierland. The Frontier mountain range had yet to begin to appear. There was a water tower where there would later be a frontier train depot. but that depot did not come in that first year in it's first year of service, and even that station was a precursor to the station that exists today. The W.D.W.R.R. 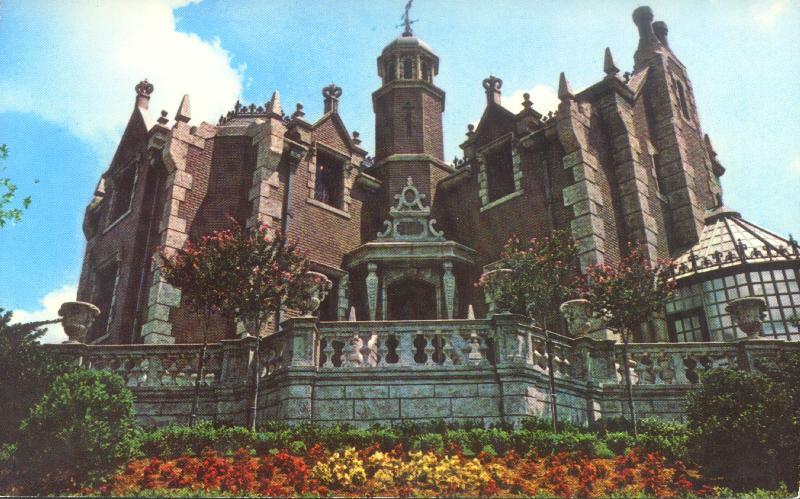 offered only Grand circle tours of the park at that time because Main Street U.S.A. was the only station . ( Depot information courtesy of Widen your World http://home.cfl.rr.com/omniluxe/frlrs1.htm) Also, there was no connection back to Adventureland near that end of the Frontier, because there was no Caribbean Square to walk through. 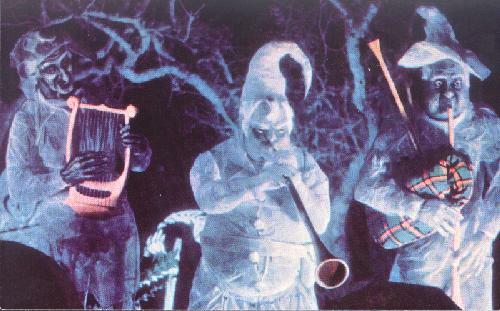 In fact there was no Pirates of the Caribbean attraction. The cut through between the Sunshine Pavilion/ Tropical Serenade / Country Bear Jamboree may well have existed already if you know one way or the other for sure please let me know. Cards 01110217 and 01110218 are the only cards from the early series of cards in Frontierland and they are both interior scenes from the Country Bear Jamboree and each is titled THE COUNTRY BEAR JAMBOREE. These two cards were also later released at Disneyland with the exact same images on the front and the same card numbers on the back the biggest differance being the" Disneyland " logo on the cards speaking of those "silly singin country bears" they also had their own series of postcards. The cards featured artwork of the bears. I believe these postcards were possibly sold from vending machines in the lobby of Grizzly Hall in two different sets of eight cards each. Those cards had their own numbering system, separate from any other WDW postcards.They have thier own page at the end of this chapter.